There are already plenty of automation tools around on Android, giving you deep hooks into how the OS runs, but a new utility called Automate has caught our attention. Like similar apps, it’s based around triggers that then result in actions, and you can build up what it calls ‘Flows’ simply by tapping and dragging. Here’s how to get started. Fortunately for the less technical among us, Automate comes with some sample Flows to make use of—if you’ve ever used IFTTT, they work like Recipes. 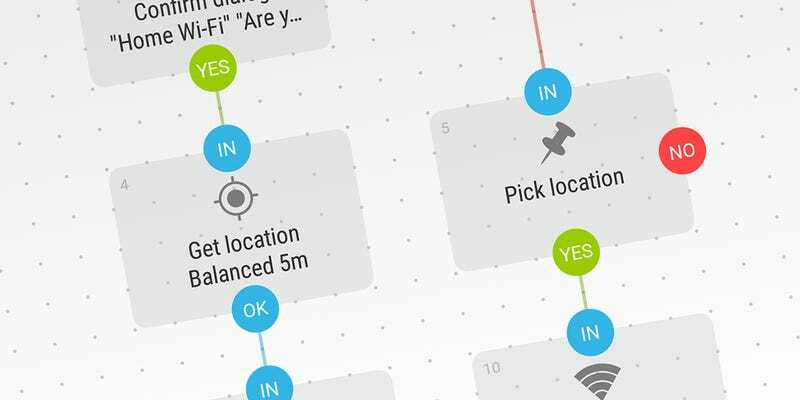 One of the Flows is based on location, automatically disabling wifi whenever you leave the house. If you tap on the relevant entry on the home screen you can see how it works. Automate’s permissions (for location, network access and so on) are installed as separate apps but you can follow the links in individual Flows to quickly set them up as required. Each Flow also comes with a log panel so you can view changes it’s making and any errors that are cropping up as you go. More Flows can be found in the user community section of the app (tap on the group icon at the top)—you can sort by ratings, date, or category. From tracking how long you stay at a specific location to automatically turning on airplane mode during the night, there are plenty of Flows to explore. Once you’ve had enough of checking out what other people are building, you can dive in and start constructing Flows of your own. Just tap the plus icon at the top of the interface then pick your ‘building blocks’ as you go—you can add links to Flows on the home screen, too. Most blocks need to be configured, which you can do by tapping on top of them. In the case of a location checking block, for example, you need to specify the relevant location on a map (or by entering the latitude and longitude coordinates manually). A running Flow is known as a “Fiber” in Automate parlance. Blocks can flow into each other and split up in different directions as required depending on what’s happening on the device. If you know a little bit about coding, you can start to introduce advanced parameters and variables to give your Flows some more depth and extra functionality. Automate isn’t one of those apps you can master in the space of five minutes, but there are enough example Flows included with the app and offered by the community to help you hit the ground running. Tap the edit button (a pencil icon) in any Flow and you can view (and even tweak) the associated flowchart.